Review: Mythical, Desperate, Miserable. Flight of the Phoenix. is by R.L Lafevers. This book is the first book of the Nathaniel Fludd Beastologist. series. Nathaniel Fludd is the main character who really likes drawing. The book is mainly for children 13 years or younger who love mythical creatures who live like any ordinary animal. Nathaniel Fludd has been waiting for his parents for more than three years. He is staying with Miss Lumpton when a lawyer declares his parents lost at sea. The lawyer sends Nathaniel to his closest relative, the last living beastologist. While he's there, he learns some basic knowledge about his family. One thing is that they all were explores and mapmakers. 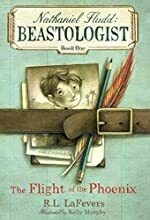 He finds out that he has to carry out his family's tradition and become a beastologist. So with his new relative he goes to Arabia to see the birth of a phoenix because it only happens every 5 years. In the middle of their plane trip they have technical difficulties because something got into their propeller! What is that something? And, will they ever get to Arabia? I was delighted by the Flight of the Phoenix. ; it is a very excellent book. The author made Nathaniel look like an ordinary boy who was not familiar with a mythical creature like a real person. There is nothing funny or exciting in the first chapter but by the end of chapter two, it gets more exciting. The author described the characters without actually telling someone their nature like writing "this guy is an always cheerful person." She described the character by their actions. The author did not make the story overly heartbreaking in spite of the fact that the boy lost his parents. She made it a little sad so that someone that has a "delicate heart" would cry over it. The author made Greasle, Nate's temporary pet, very funny in her manner of speech and in what she says. For example, when Nate clumsily sits down on an open airplane she says "Hey, watch what you are doing you big dolt." Also, if you have an imagination, depending on her size you could make her voice sound small and thin. The author made Grease look weird too. This was shown in the illustrator's great drawings which show what the scene is like so the author doesn't have to describe the scene too much. I encourage you to read the books in the series as well. This book is a very good and interesting book to read. We would like to thank Houghton Mifflin Harcourt for providing a copy of Flight of the Phoenix for this review. Have you read Flight of the Phoenix? How would you rate it?